The High Energy Flexible Magnet Strip has a strength rating of 10 pounds of pull per linear foot and 60% more strength than a regular magnetic strip of the same size. The strip is magnetic on one side and adhesive on the reverse. The adhesive has a peel-off liner, which protects it from exposure to air until ready for use. The strip withstands temperatures from 0 to 150 degrees F and can be cut with scissors. 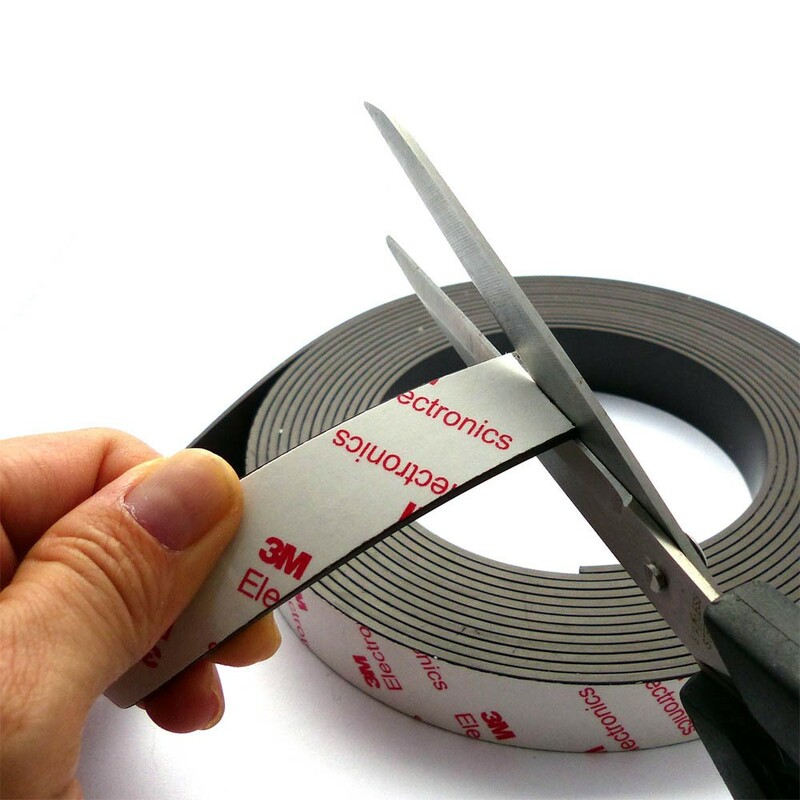 This flexible magnet with 3M adhesive lets you conveniently attach non-magnetic objects to metal surfaces and can be easily cut to desired length with a pair of scissors. 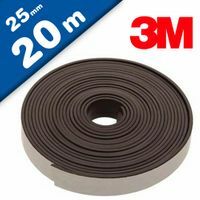 Flexible Magnet Tape with 3M adhesive is a general pupose, flexible magnet tape that allows reclosbale magnetic attachment to metallic surfaces and is coated with a high performance, low surface energy acrylic adhesive, which provides a high bond strength to most surfaces. he flexible tape has a range of applications far beyond those associated with traditional, stiff, rubber based magnet tape. Industrial uses include: mounting signage, building displays, securing metal doors, and attaching tools to machinery. Manufacturing applications include: attachments in containers, baggage, garments, door seals, and electronics. Arts and crafts and household uses include: hanging artwork, and window coverings, temporary attachment of seasonal decorations, labeling and holding light weight, flat objects like plastic, cardboard signs on to metal surfaces. The acrylic adhesive also provides excellent adhesion to surfaces contaminated lightly with oil typically used with machinery parts. Simply cut it with scissors, peel off the backing and attach. Apply the tape to items of your choice and display on any magnetic surface. Make anything magnetic! For best results, always clean surface with alcohol solution or alcohol pad to ensure surface are clean and free of grease, oil or any liquid before sticking on 3M adhesive side. Flexible magnets can be easily cut and shaped for a range of applications. They are produced by mixing powdered iron or ferrite with a rubber or plastic binder, and then extruding or rolling into the desired shape. Flexible magnets can have adhesive backing and be laminated with a printable vinyl coating. 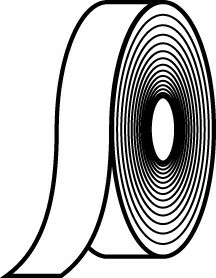 Flexible magnets are typically magnetized with multiple poles on one surface to generate a stronger holding force. High-energy flexible magnets can sometimes be used in place of ceramic materials if tight tolerances are not required. The application temperature range is determined by binder material properties. This flexible magnet is multi-pole, anisotropically magnetised, hence offers higher strength compared to other standard flexible magnetic tape. For best results, always clean surface with alcohol solution or alcohol pad to ensure surface are clean and free of grease, oil or any liquid before sticking on 3M adhesive side. This flexible magnet with 3M adhesive lets you conveniently attach non-magnetic objects to metal surfaces. Suitable for holding flat objects like plastic, cardboard signs on to metal surfaces, can be easily cut to desired length with a pair of scissors. However the magnetic strength is nowhere comparable to neodymium type magnet. Note: Not suitable as a magnetic base to attach neodymium type magnets. This flexible magnet will get de-magnetise on contact with neodymium magnets due to the extreme magnetic strength of neodymium magnets. Who supplies high quality Magnetic Tape with 3M Self Adhesive? Magnosphere offers best priced Magnetic Tape with 3M Self Adhesive globally to all industries, including Automotive, Aerospace, Military, Advertising, Design House, Electronic and Academic/R&D. Please inquire for custom Neodymium magnets or magnetic assembly. Buy Magnetic Tape with 3M Self Adhesive at Magnosphere and get a better deal!